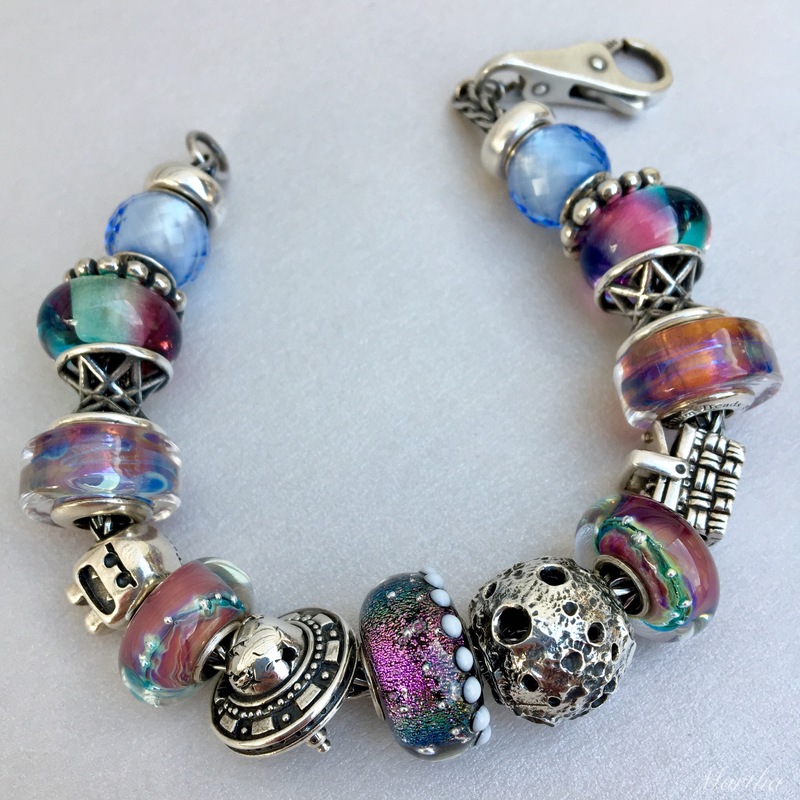 Today’s blog post is a sky themed one with the new UFO and Rainbowed beads from Ohm Beads. The UFO ($70 USD/$90 CAN) is so awesome with lots of detail. I love the little cracks and patches and how the hole goes through diagonally. On the bottom is some lovely detail. I really like beads like this that have lots to look at from every angle. Rainbowed ($40 USD/$50 CAN) has a little patch of cloud, which you can see in some of the photos. 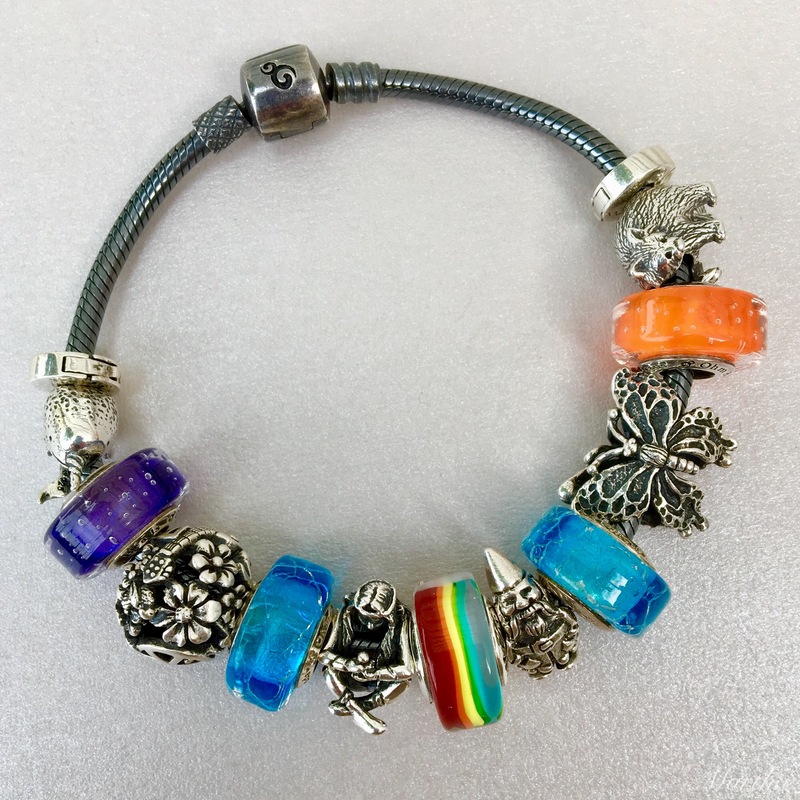 I like to think of this bead as a reminder that there is always something positive, even if the skies seem cloudy. The first combo I tried was with these two new beads and my old Luna. 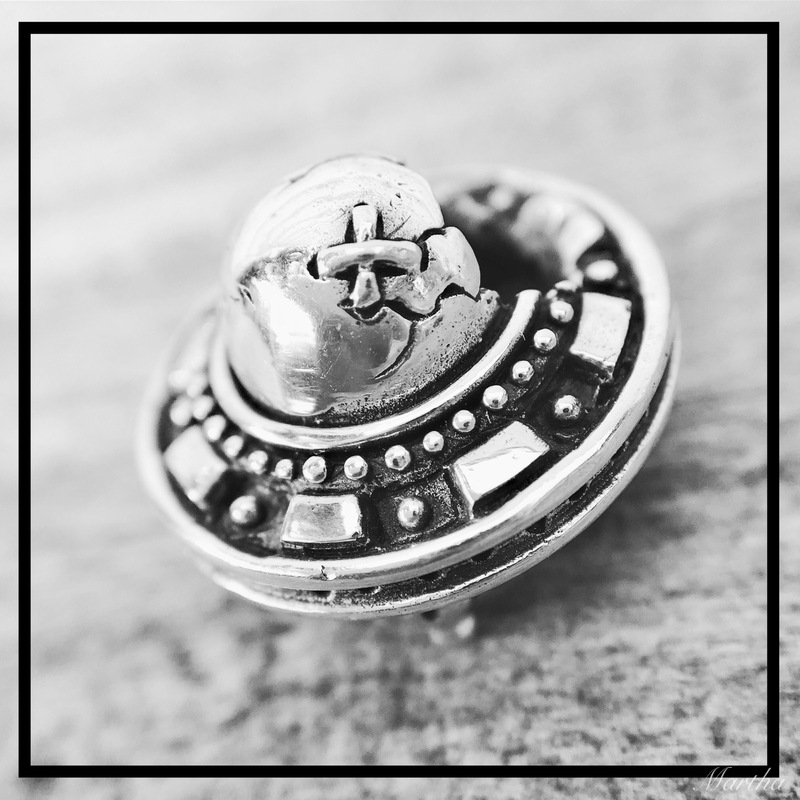 Luna is a great match to the UFO size and theme wise, but as it’s no longer available there are similar but slightly smaller beads that could be used like Redbalifrog’s Luna Moon or Faerybeads’ New Moon. The other glass beads here are my beloved Purple Haze beads. For a whimsical Zombies in Space bangle I used the Jiangshi and the True Beadz Sputnik dangle. 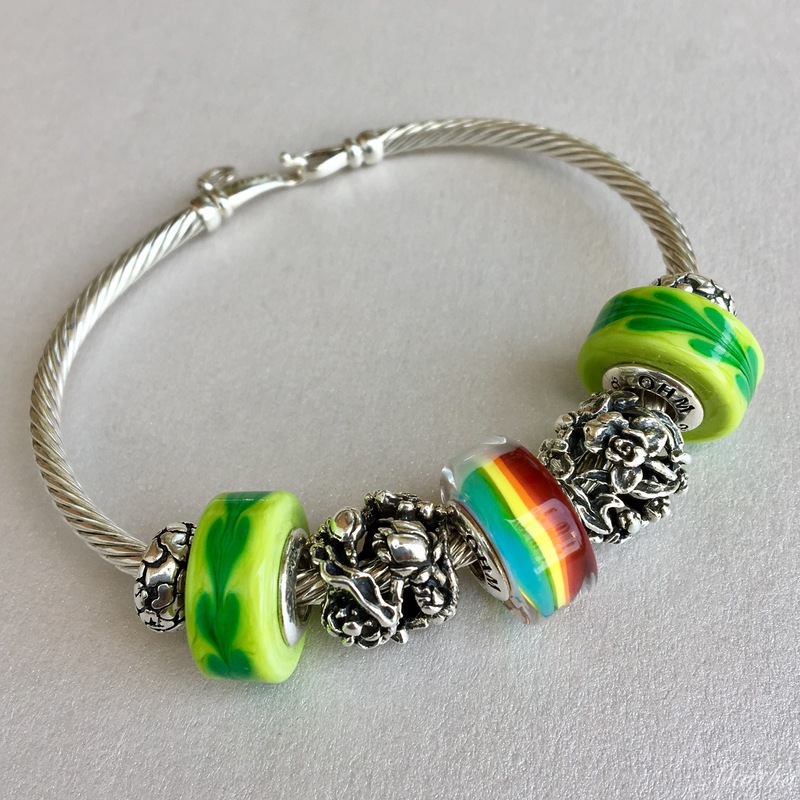 Next up is a bright, nature themed bangle using the green Trees beads and the silver Iris and Rose beads. To expand on the life and nature idea I used the adorable Saul the Narwhal, Woodstock, My Precious, Mr. Gnome, Butterflies and Paula the Red Panda silver beads. Since I had some brightly coloured Ohm Beads out I decided to go for it and put together an array of fun beads. Most are retired or sold out limited edition beads but the Strawberry and Trees ones are still available. Continuing with a space theme I’d thought I’d try to gather up any beads of an inky blue shade. 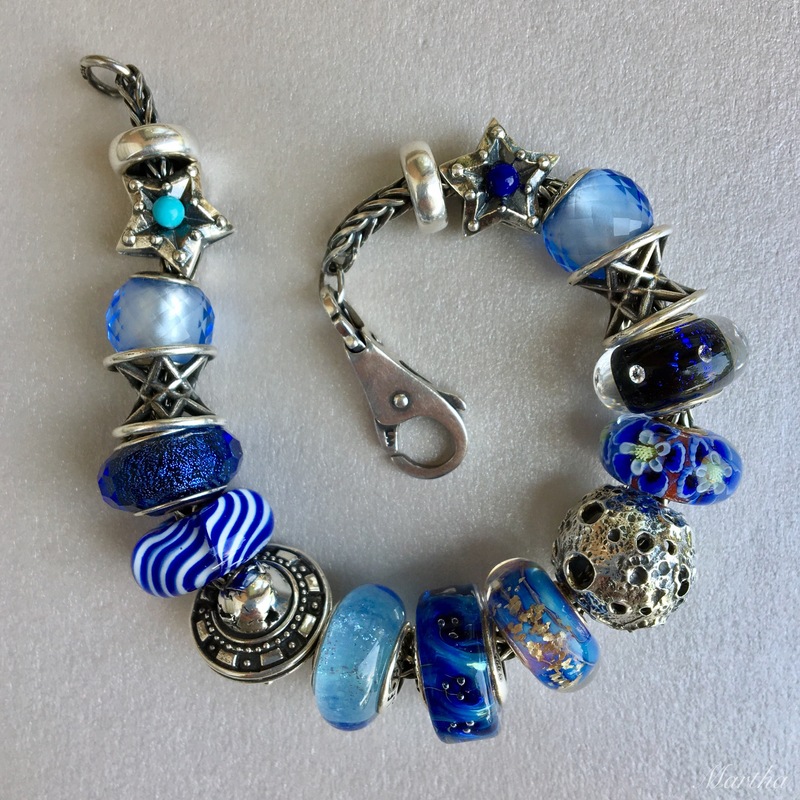 The Ohm Beads Waterfall at the bottom of the photo is perfect with the deep swirls. The bead to the right of it is an Elfbead and everything else is Pandora and Troll, other than the Luna. Finally, here is my favourite bracelet of the bunch. I call this one Sock Monster Goes for a Picnic on the Moon. There are six brands on here but I think they work so well together. 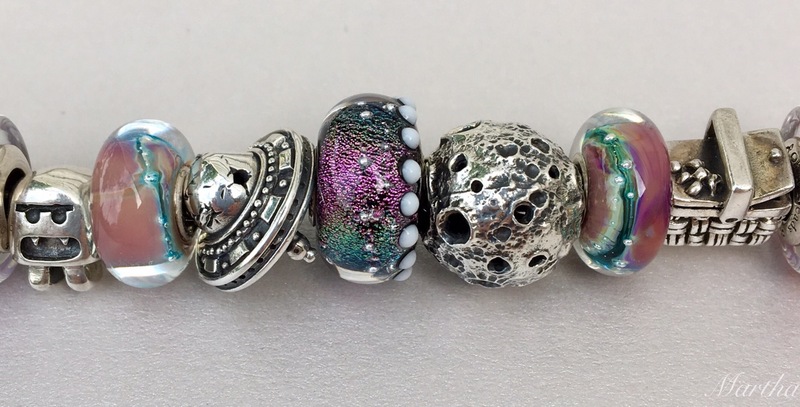 Below left to right are a Pandora Petite Facet, Trollbeads Lotus Top, a Melanie Moertel bead, Trollbeads Smile of Stars, Ohm Bead Purple Haze and Sock Monster, a Summersday bead and the Ohm Beads UFO. Below left to right after the UFO are Elvira by Beauty Beads from Perlen, another Summersday bead and then the Ohm Beads Picnic Basket. I had so much fun playing around with these beads and the UFO is a real standout for me. 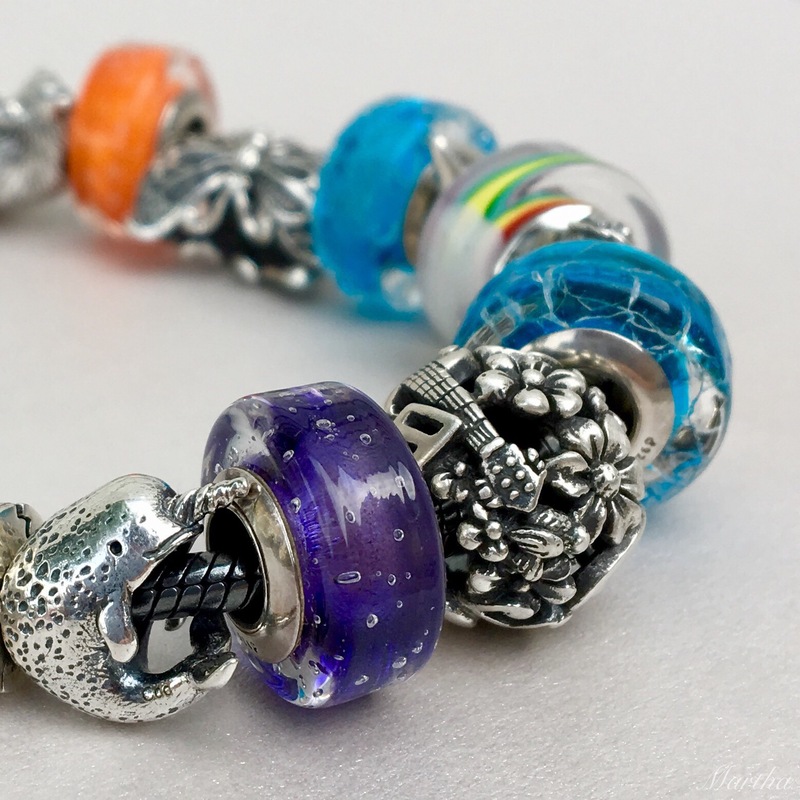 Coming up later this week will be Aunt Gnome and Gnome Home, also from Ohm Beads. Did anyone else get Rainbowed or the UFO, or are they on your radar? Now there are some fun, colorful bracelets to start my morning with! 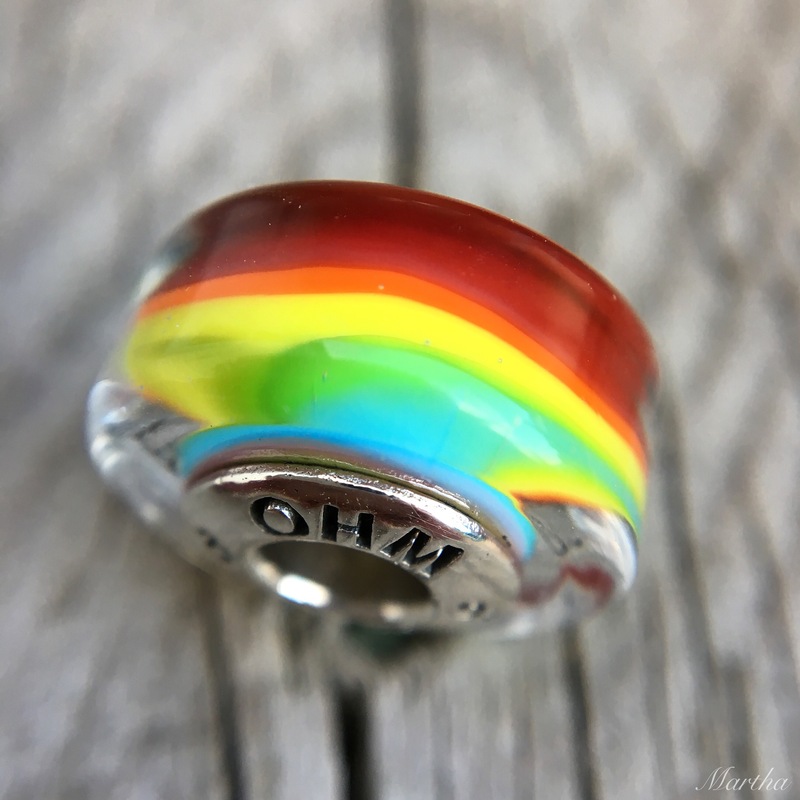 My favorite is the Sock Monster Picnic, but I love the one with all the colorful Ohm glass too. It looks like candy! The UFO bead is definitely on my wish lust. 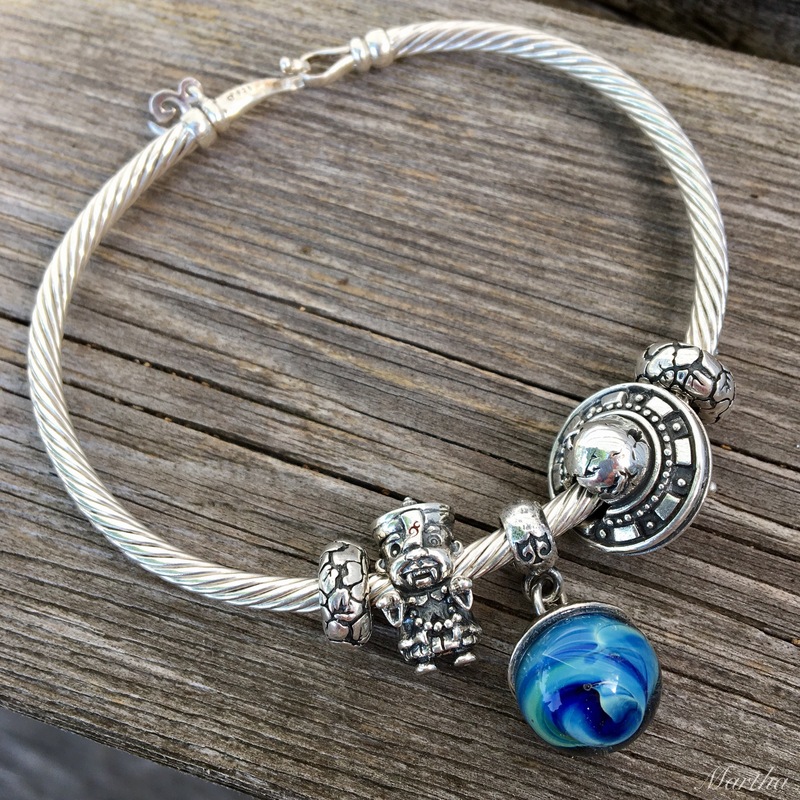 I love all the details, and I like how it sits on a bracelet. Good morning, Kim! The UFO is just so cool and I love how big it is, too. I wore that Sock Monster Picnic bracelet for 3 days straight, I think-almost a new record for me! LOL! There are SO many things to love here, Martha!!! 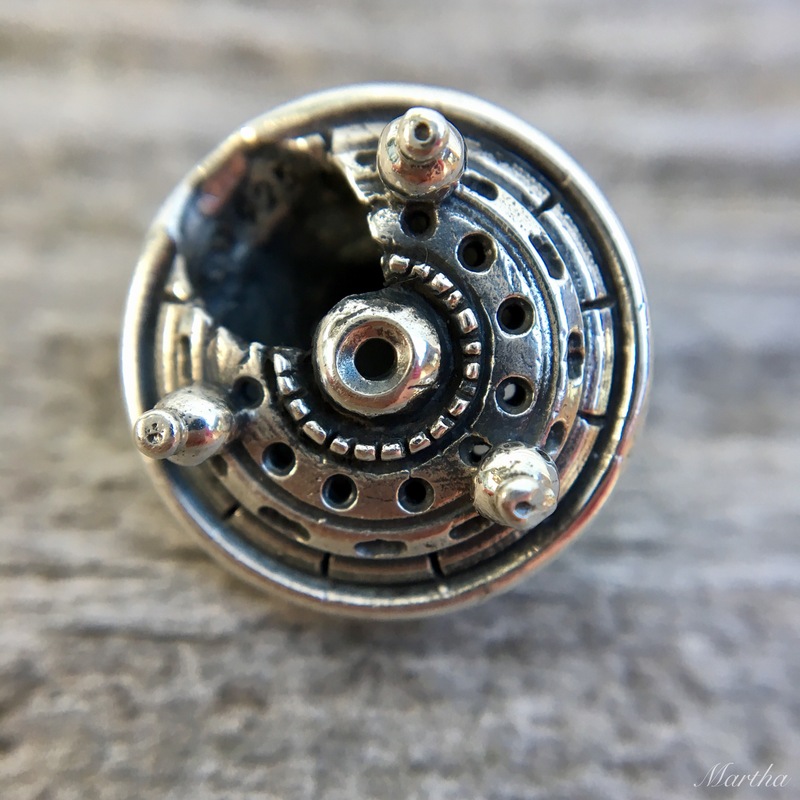 First I definitely want the UFO bead and I love how it’s cracked and patched up. The way it sits makes it appear to be taking off…plus I think that might stabilize it better. I hate when beads flip around. One of my biggest bead regrets is that I missed Luna, but that is just because I started collecting after it was already gone. 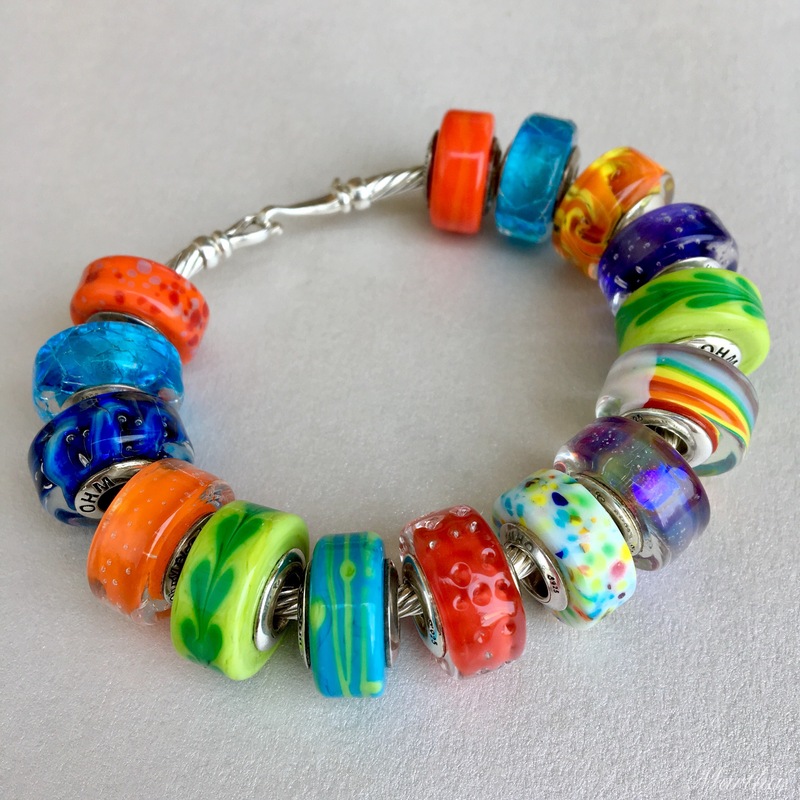 Your bracelet with the different color glass is wonderful! A while back you used Confetti Upchuck in a combination with some other glass beads and I actually managed to get it. I would love to find Purple Haze, but that’s difficult, too. I should have gotten that when I could, but I didn’t. Last, but certainly not least, it is a pleasure every time I see Sock Monster!!! And Kim, I too lust for beads! Yeah, the UFO is a bead that has a lot of movement in the way it appears. Like you said, it seems to be taking off or flying through space the way it’s on an angle and the dings and cracks really give it character. 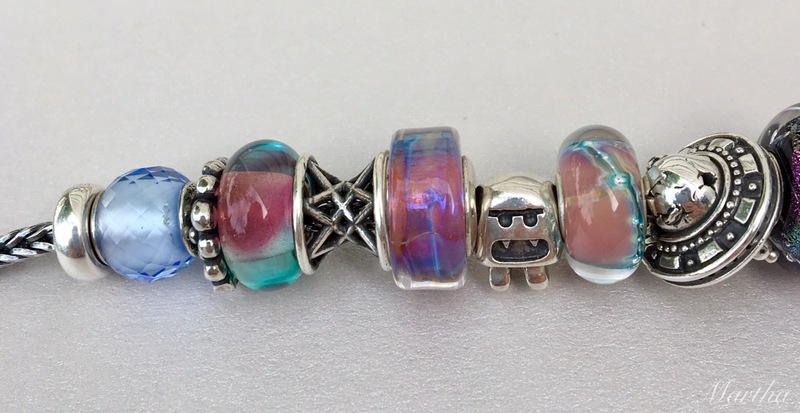 I’ve got to say that I use the Purple Haze beads all the time…they are quite special. I’m glad you enjoy seeing Sock Monster! He’s quite the little character! Thanks Cathy! I’m glad you enjoyed it and thanks for reading! Oh, that’s great that you like the Narwhal too! Glad you like the UFO also, it’s such a fun bead! Awesome photos! Really enjoyed all of your combinations. Thanks April! This was a super fun post to put together. The sockmonster moon picnic bracelet is soooo funny! I love it! Thanks Emme! I love it too and had so much fun wearing it. 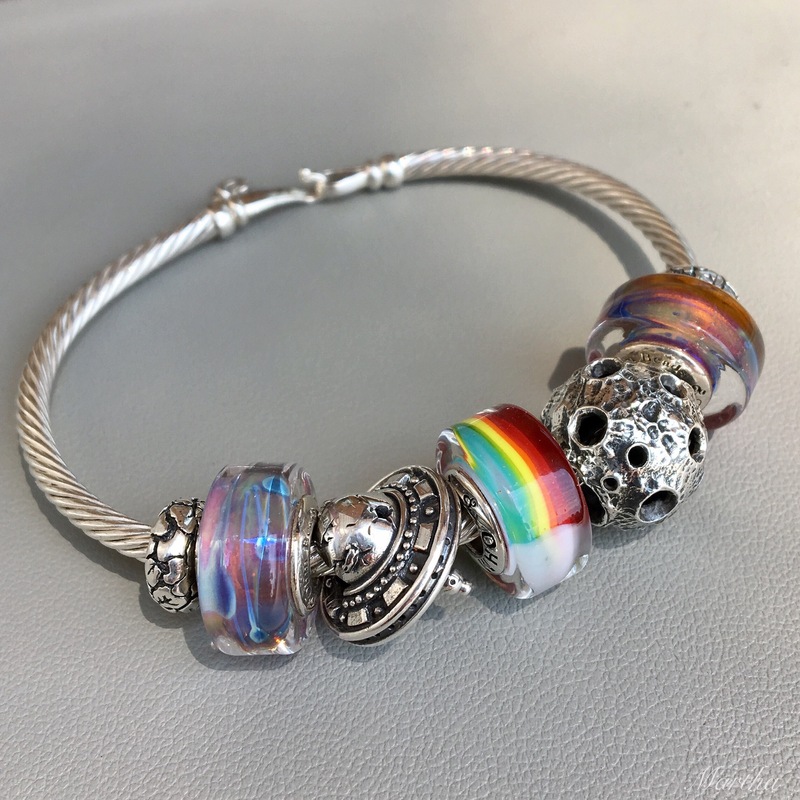 Hi Martha, No one has commented on the “Rainbowed” bead yet but I love it. I also purchased it and I agree that it does give you a happy feeling. Your “Rainbowed” is a lovely one indeed. Gayle, I think it turned out to be a love it or hate it kind of bead with the cloud on it. If I don’t want to see it I just turn it around, but I think it gives it character.